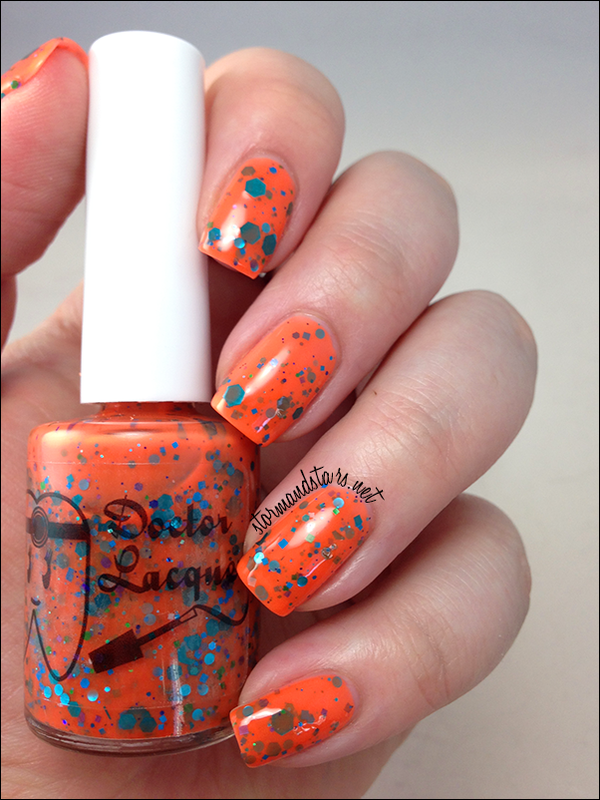 I have another collection for you tonight from Doctor Lacquer. 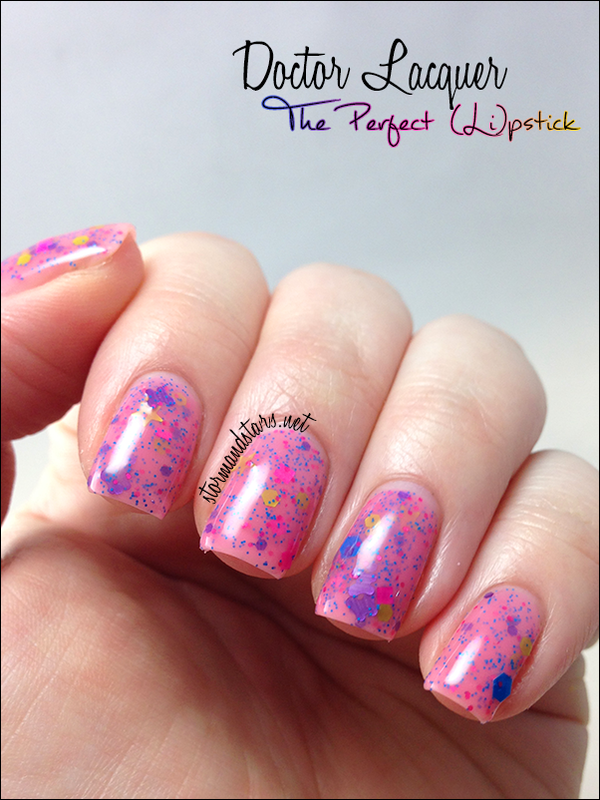 This one is super special to me since I named the lacquers! Angelyn contacted me to help her come up with some names that referred to the elements these beauties were based on and I was happy to help. Each lacquer is inspired by the color that it's element burns. Meet the Elements Of Style Collection! First up is (Ba)ck In Style inspired by burning Barium. 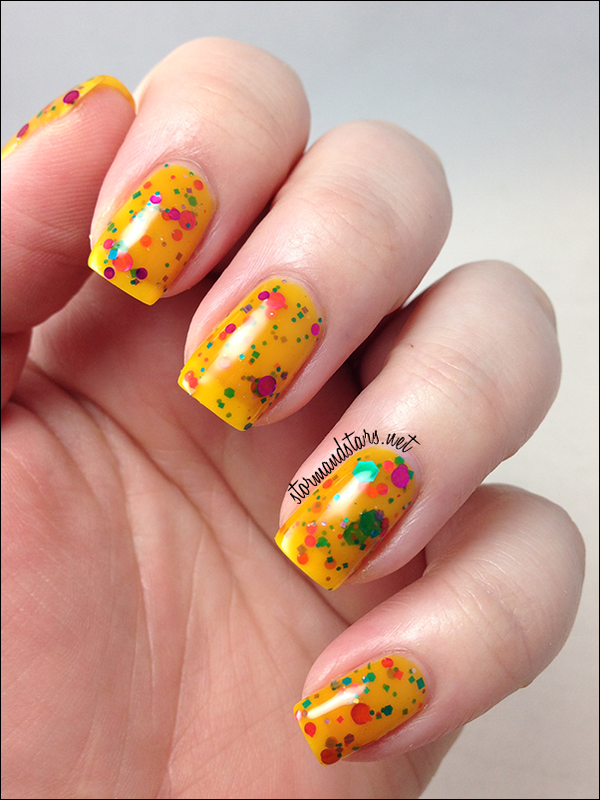 (Ba)ck In Style is a yellow-green jelly with pretty pastel glitters floating in it. It's super sheer, but I like it this way! 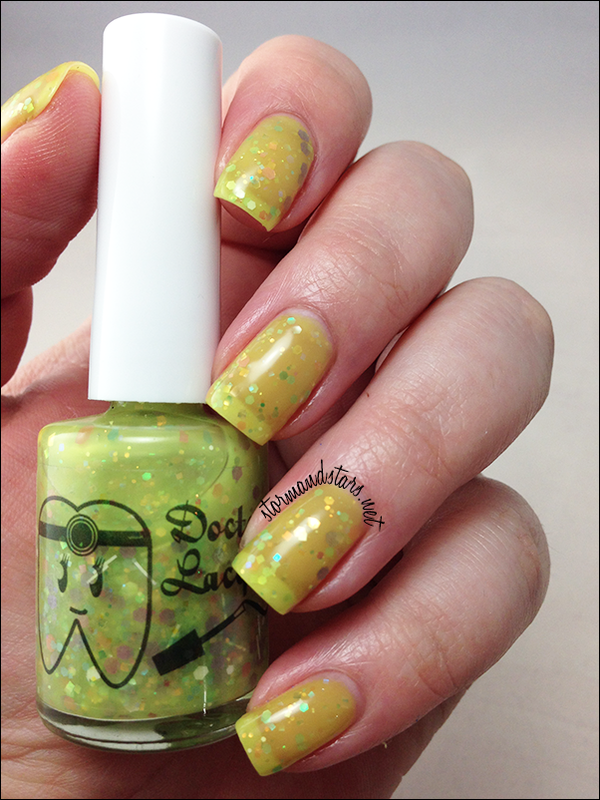 I used three thin coats of the lacquer plus Glossy Glam topcoat for these photos. The formula was great and I really like the look of this. 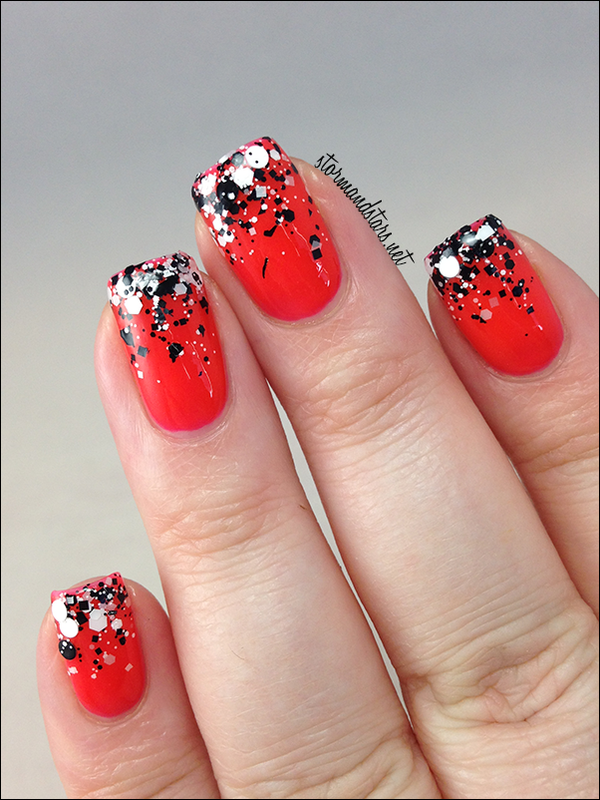 Next up is the super bright (Na)tural Beauty, inspired by burning Sodium. 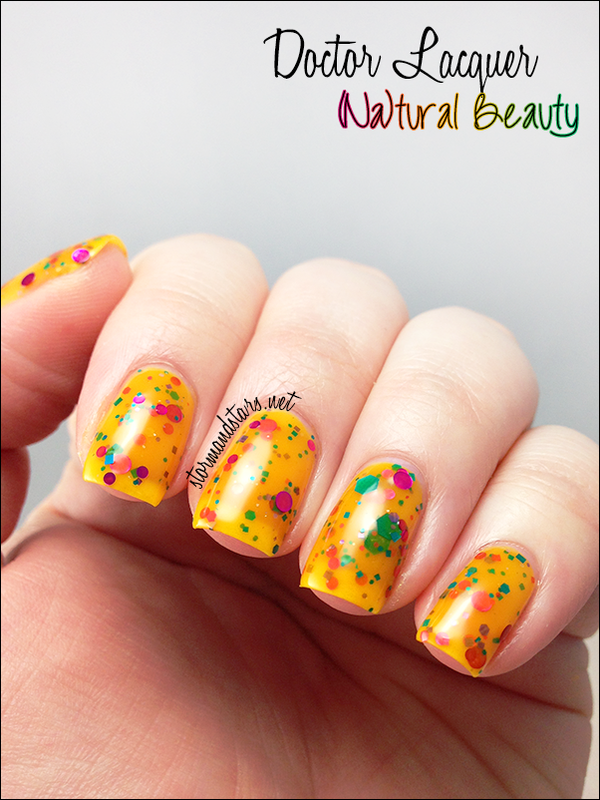 (Na)tural Beauty is a golden yellow jelly with super bright green, orange and magenta glitters throughout. 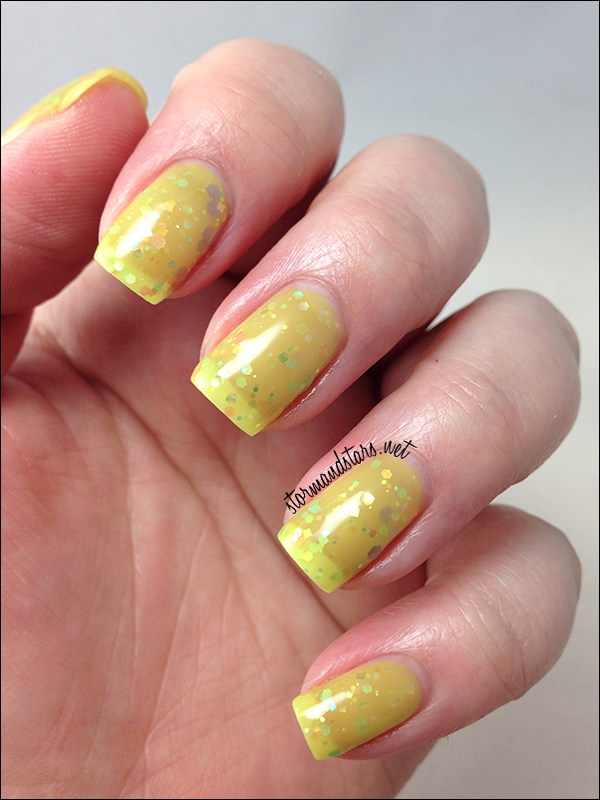 I used three thin coats plus topcoat for these photos. I didn't think I would like this one but I really fell in love with the bright color combo and the base looked great with my skintone. This beauty is 24(K), inspired by burning Potassium. Eek! I love gray polish and this one is no exception. 24(K) is a sheer gray jelly with big and small magenta circles and purple hexes. This color combo is really perfect. 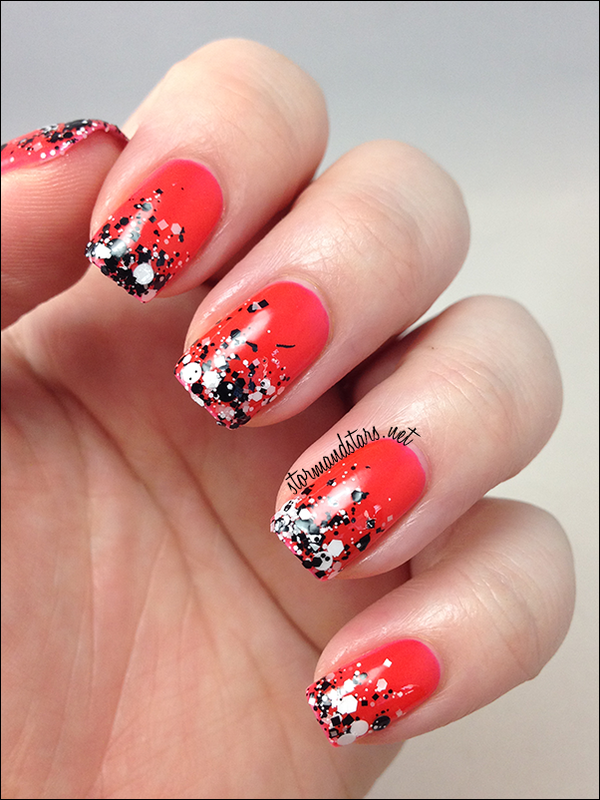 For this mani I used three thin coats of 24(K) topped with Glossy Glam topcoat. Here we have Fashion (Mg)azine, inspired by burning Magnesium. Everyone loves a white crelly right? 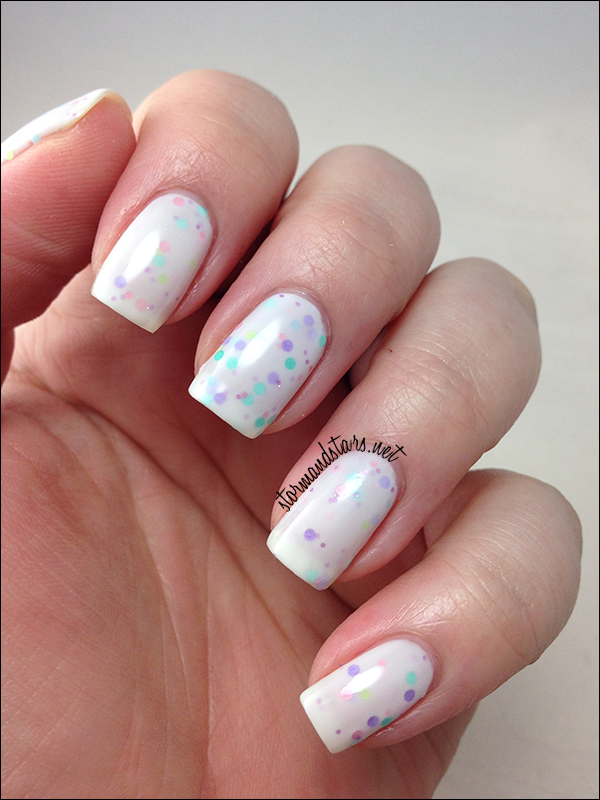 Fashion (Mg)azine is a white crelly with pastel glitters. The formula on this lacquer is just perfect. Usually I find white crelly polish to be streaky or goopy or too sheer, but I used three thin perfect coats of this for a just right finish. I topped the whole thing with a shiny topcoat. Haute (C)outure is my favorite lacquer of the collection, this one is inspired by burning Carbon. Because this one is the only glitter in a clear base, I decided a glitter gradient was in order! 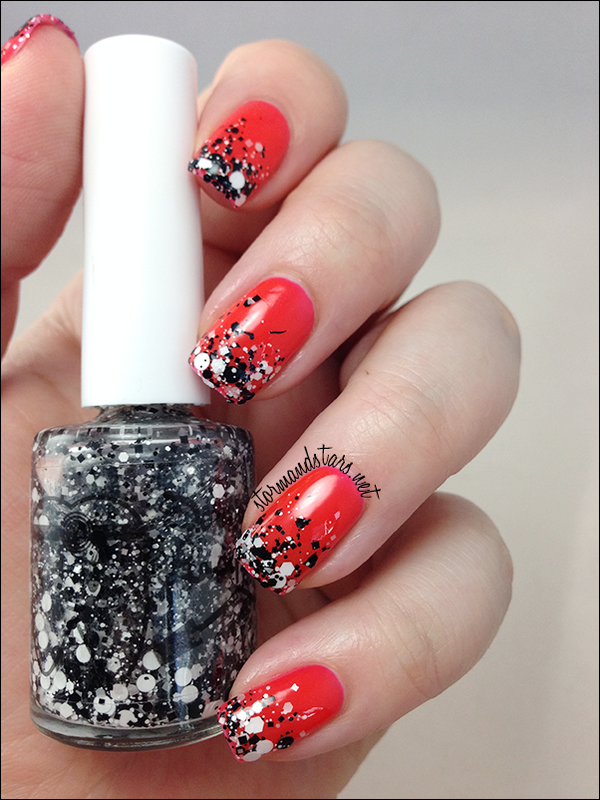 Haute (C)outure is a black and white glitter in a clear base. I sponged this on my tips over a base of Essie Camera. I'm so happy with this one! NEED ALL THE BLACK AND WHITE GLITTER!! 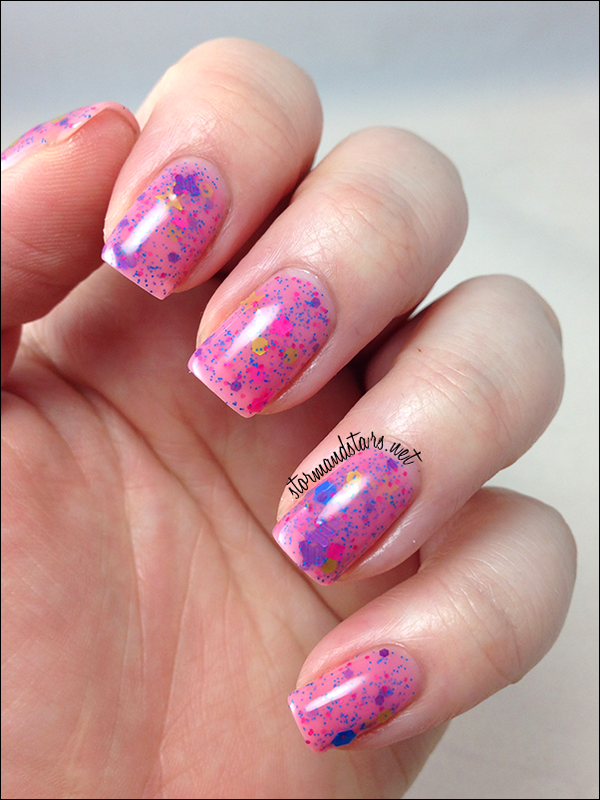 Here's another super fun lacquer. This is The Perfect (Li)pstick, inspired by burning Lithium. The Perfect (Li)pstick is a pink jelly with all different sizes and colors of glitters including huge blue hexes, purple butterflies and yellow stars! I used three thin coats plus gelous to smooth the glitter and Glossy Glam topcoat to finish it off. 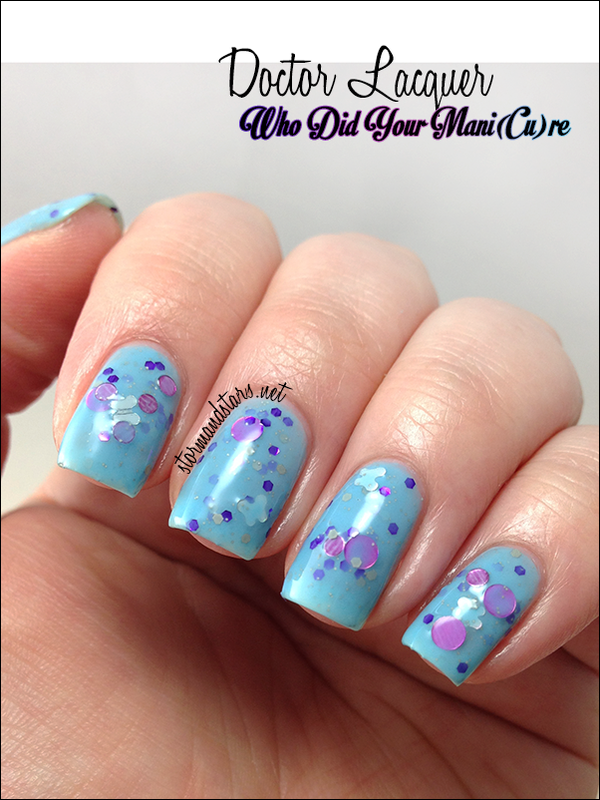 Who Did Your Mani(Cu)re? is inspired by burning Copper. Who Did A Mani(Cu)re? 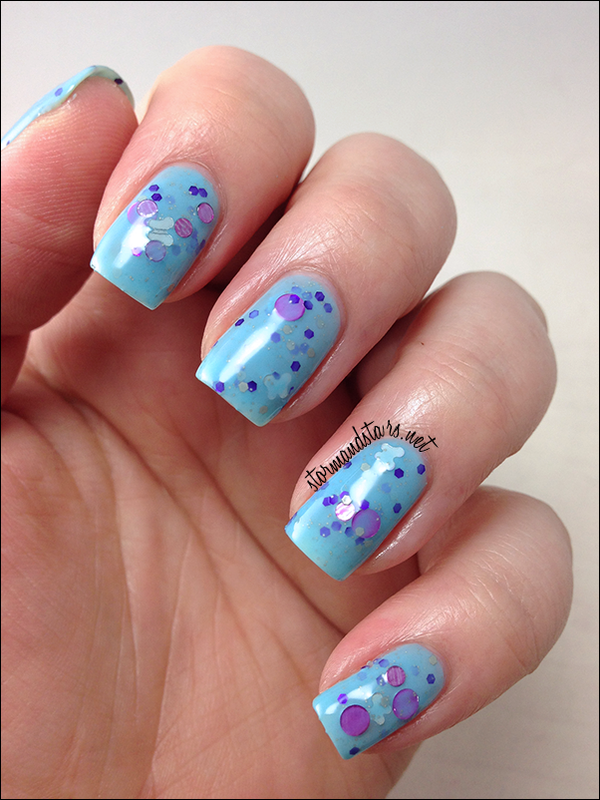 is a blue crelly with lots of glitter including huge purple circles and blue butterflies. For these swatches I used three coats of the lacquer plus a coats of gelous to smooth out the glitter and topcoat to make it all shine. Work The (Ca)twalk is another of my favorites. This one is inspired by burning Calcium. I love how bright the orange base is in this lacquer. 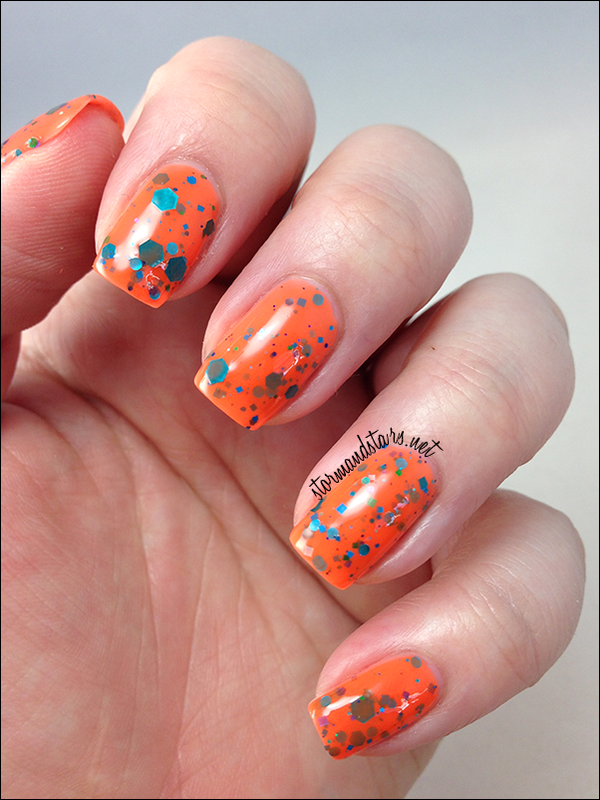 This neon orange jelly is packed with all sizes of bright teal metallic hexes. 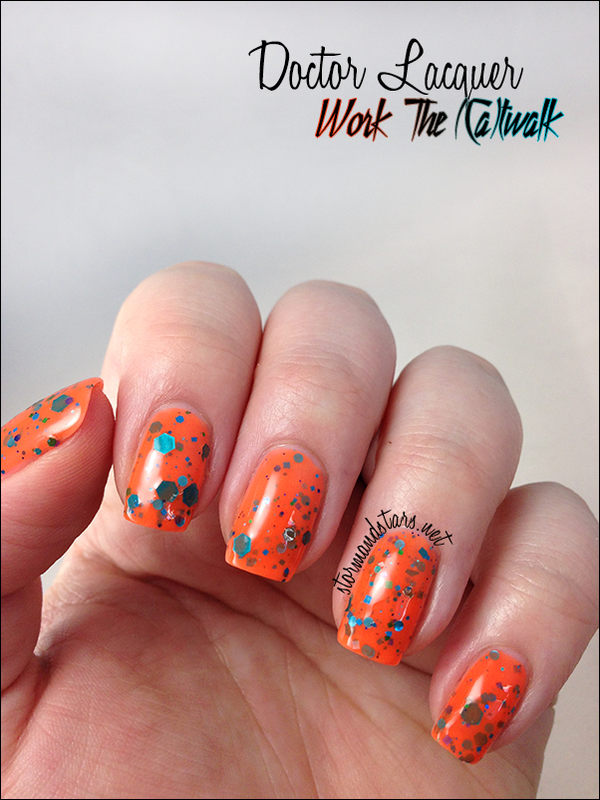 For this mani I used two coats of Work The (Ca)twalk plus Glossy Glam topcoat to finish it. What do you think of the Elements of Style collection? My must have lacquers from this collection are Haute (C)outure, Work The (Ca)twalk, 24(K) and (Na)tural Beauty. These lacquers are all available now in the Doctor Lacquer Shop. You can also follow Doctor Lacquer on Facebook and Instagram for news about upcoming collections and the brand as well as other swatches and reviews of the lacquers.